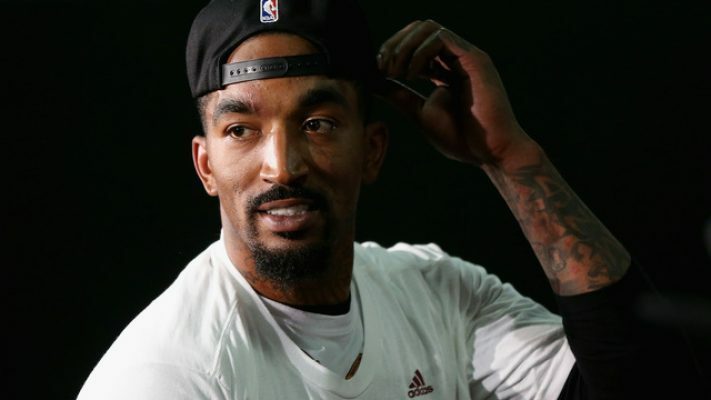 Cleveland Cavaliers guard J.R. Smith is technically still a member of the team, but his banishment by the organization means that he will no longer be putting on a Cavaliers uniform. That status allowed him to attend Sunday night’s New York Knicks-Miami Heat contest at Madison Square Garden, with the message on his hat garnering some attention. In January 2015, the Cavaliers acquired Smith from the Knicks, which gave the veteran a new lease on life after what had been a checkered NBA career. He was part of the Cavaliers’ historic comeback in 2016 that resulted in the organization’s first title and took part in each of the four trips to the finals made by the Cavs. Of course, those trips had some bumps along the way, beginning with his shooting struggles in the 2015 finals. However, the most notorious of his missteps was his brain cramp in the closing seconds of regulation in Game 1 of the 2018 finals. Instead of attempting a game-winning shot following a missed free throw, he dribbled away from the basket, which resulted in a desperation shot at the buzzer that missed. The Cavaliers then lost in overtime and were swept by the Golden State Warriors in four games. The 33-year-old Smith signed a four-year deal with the Cavs in October 2016, with that contract now paying him $14.7 million to not play for the team this season. He’s also due $15.7 million next year, though only $3.87 million of that is guaranteed. The Cavaliers have thus far had no luck in trading him, though that market may pick up as the trading deadline gets closer.